Our relationship with food - should we really care? Most of us now are enjoying summer and waiting with exciting anticipation the beginning of Ramadan, the fasting month for Muslims. Those people who observe the month of fasting are usually keen on gaining spiritual revival through personal reflections on past events and regular habits. It’s a time of year when people strive to perfect their relationship with God, their families and communities. And in the process, new resolutions and promises are made that translate the individual’s belief and value system into action. Ramadan is also a time when community members make extra effort at hosting and serving iftars (i.e. break-fast meals). Whether at peoples’ houses, in mosques, or community centers, organizers of these iftars spend a good chunk of their time thinking about the food they’ll be serving their guests. Attendees at these iftars also look forward to savoring a hot delicious meal when breaking their fast with their fellow fasting Muslims. And so, there is no better time to reflect on our relationship with the food we eat than during the month of fasting. 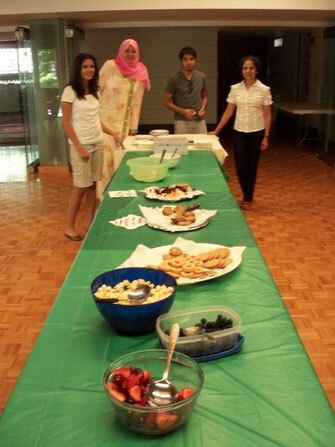 With that in mind, Noor Cultural Centre in Toronto launched their ‘Focus on Food’ film and discussion series this July. The series will continue in September, with sessions focused on access to food, health, and genetically modified organisms (GMOs). Three documentaries were featured that explore some of the ethical issues involved in food production and consumption: Food Inc. that “exposes America’s industrialized food system and its effect on our environment, health, economy and workers’ rights.”; Jamie’s Fowl Dinners that examines current practices in intensive egg and chicken production; and the third upcoming one (July 24) entitled El Contrato exposing the conditions of temporary migrant-workers in Southern Ontario. I was lucky to be present among a number of concerned citizens who came for the screening and discussion of Jamie’s Fowl Dinners. Jamie Oliver is a renowned British chef who hosted a gala dinner and served his guests a number of dishes with chicken and eggs as main ingredients. However, Jamie’s guests have to know the full story of the egg and the chicken before eating their dinner. Jamie’s idea is that if people see where and how their food comes from, they will make smarter choices when they shop for food. This documentary covered the practices of factory farming that views chicken as “egg and meat producing machines” driven by a consumerist culture that pushes for quicker, cheaper and more “deliverables” per animal. Achieving this goal comes at the expense of the welfare of the chickens during their lives in cages, and the nutritional value of the eggs and meat produced. With the rise of a new generation of consumers who care about where their food comes from, who are conscious about what they put in their bodies, the documentary covered alternative practices to factory farming. They include cage-free, free run, and free range farming of chicken for eggs and meat production. These practices aim at raising chicken under more humane conditions that give these submissive creatures access to natural light, space to roam, and food most suitable to their digestive system. Such care in raising these animals for human food translates to better quality and higher nutritional value meat and eggs. After the movie, Mr. Fahim Alwan gave the audience a short talk on his longstanding interest and involvement with ethical production of food inOntario. Mr. Alwan is the founder, owner, and operator of BlossomPure Organic, an organic ethical meat, dairy and grocery company in the GTA. Mr. Alwan said that his business philosophy is to provide customers only with high quality and nutritious food products that he would serve to his own family. “This means that food should be locally grown, in agricultural lands with no synthetic fertilizers or chemical spray, produce that didn’t travel for days to get from the source to the customers, animals raised and slaughtered by local farmers and ‘merciful’ butchers under clean conditions with best practices for their welfare, and everyone involved is conscious about their environmental footprint”. When asked about financial accessibility of organically- and ethically-grown food by people with limited income, Mr. Alwan made a thought provoking comparison: cheap and mass produced food products have inherently low nutritional value due to the practices in its production, not to mention preservatives and chemicals when processed further. Hence, people end up buying supplements to compensate for the deficiencies in vitamins and minerals in their meals or end up developing food allergies to some unknown ingredient not listed on the label. Whereas, if one looks at food produced according to the best ethical practices in farming as an investment in one’s health and their families, then it evens out. Observant Muslims are instructed in Quran to consume “halal” and “tayyib” food (see verse 2:168). The Arabic word “halal” is often translated to “permissible” and “lawful” according to the Sharia law concerning the slaughtering of the animal with a specifically prescribed way and prayers. The Arabic word “tayyib” is often translated to “good”, “pure”, and “wholesome”. Commentaries on the aforementioned verse emphasize that the word “tayyib” is one of Allah’s attributes as in Nawawi Hadith #10 that states: “Verily Allah the Exalted is pure. He does not accept but that which is pure. Allah commands the believers with what He commanded the Messengers. Allah the Almighty has said: “O you Messengers! Eat of the good things and act righteously” [Muslim 23:51-53]. They also elaborate by saying that pure food should be beneficial to the body and mind. Hence, it is at the heart of the Islamic teachings that Muslims give equal weight to the purity and wholesome aspect of the food as to the mechanical slaughtering of the animal according to Shaira law. At the end of the film screening and discussion, the attendees shared their favourite dishes prepared using local, sustainable, and organic ingredients. Everyone left that Sunday afternoon with an answer to the key question – should we really care about our relationship with food? I wish to thank my sister for her remarkable insights while writing this essay. Special thanks go to Ms. Samira, Azeezah and Khadijah Kanji for organizing and promoting the ‘Focus on Food’ series. Dr. Hind Al-Abadleh is an Associate Professor of Chemistry at Wilfrid Laurier University in Waterloo, ON.